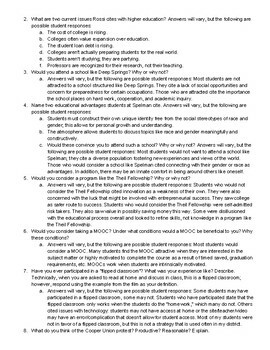 This is a handout for students to complete as they view Rossi's Ivory Tower (2014). 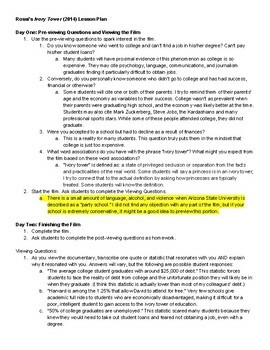 The documentary entertains: "As tuition spirals upward and student debt passes a trillion dollars, students and parents begin to wonder if college is worth the expense." 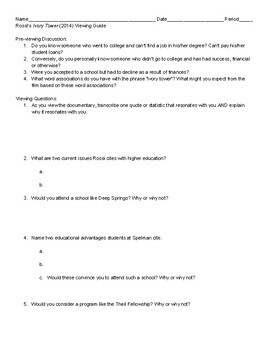 It includes pre-viewing discussion questions (4), viewing questions (8), and post-viewing questions (3). It's designed to keep students engaged and allow them to reflect on their own educational experience and expectations. In addition to the handout, there is an answer key with typical answers for all questions. Also featured in this product is a CAP (creative, analytical, and practical) activity to synthesize the documentary. CAP activities are a great way for teachers to easily differentiate in the classroom. 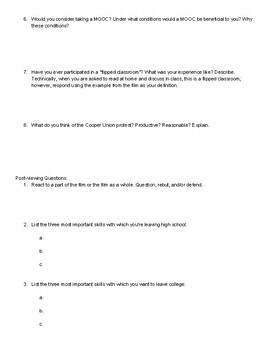 The handout asks students to choose and complete one of the activities in a small group. "In Historic Vote, Renowned Art School Cooper Union Commits to Return to Free Tuition For All"
Looking for a high-interest documentary to start a discussion? Check out my viewing guides for Schooled: The Price of College Sports!